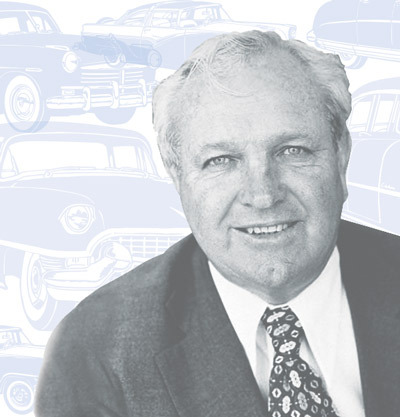 Wesley “Bud” Hubbard helped people get where they wanted to go. Traffic was a serious problem in 1950s-era Santa Clara County. Farmland was giving way to industrial complexes and a growing workforce was sitting tailfin-to-bumper in Chevy Bel Airs in the congestion of burgeoning city streets. In 1957, civic leaders in Palo Alto proposed a partial solution: converting two-lane Oregon Avenue into a four-lane highway—an undertaking that would cost 107 residents their homes. This dedication to leadership was the hallmark of Hubbard’s dynamic and purposeful life. As a two-year captain of the San José State football team, Hubbard led the squad in the first home game ever in Spartan Stadium in 1933. (They beat San Francisco State 44–6!). After a year playing on the defensive line for the Brooklyn Dodgers NFL team, Hubbard returned to San José to marry his college sweetheart, Beatrice “Bea” Cilker. For the next 43 years, they served their community through civic leadership and volunteerism, while operating a successful lumber business and raising five children. Shortly after his passing in 1981, the family established the Wesley L. “Bud” Hubbard Memorial Scholarship for outstanding political science majors interested in a career in local government. Over 26 years, Cilker attended many of the annual scholarship ceremonies to watch nearly 40 students receive the award and go forth to walk in her husband’s footsteps as public servants—ensuring that Bud Hubbard’s legacy rolls on. The Wesley “Bud” Hubbard Scholarship is presented by faculty members of the College of Social Sciences to political science majors with demonstrated leadership potential and a commitment to taking an active role in the community, especially those planning careers in San José or Santa Clara County government. Past recipients have become lawyers, political strategists, political science professors, policy writers, field representatives for politicians and more. What will your legacy enable students to do?